Our fascination with ancient Egypt is never satiated. The magic and mystery of ancient times, in the land of the pharaohs, remains as captivating today as it was 2,000 years ago. Fortunately, the UK's leading online bingo room – 888ladies – makes it possible to go back in time to experience this for up close and personal. Pharaoh's Luck features iconic Egyptian structures such as the Sphinx and the Pyramids of Giza along with mega-prizes up for grabs. This game is packed full of mini-games, and with so many chances to win, players could truly get a taste of a King's ransom in real-money winnings. Pharaoh's Luck scratch card is peppered with opportunity. A dimly backlit sky, silhouetted with pyramids, sets the mood for this magical instant game. The beautiful background of Pharaoh's Luck is unique, in stark contrast to most other instant win games. The symbols in this game add to the magic and mystery of this game. The design of the game is visually stunning and the game is surprisingly user-friendly. The layout is clear so you can easily navigate your way though the game. Players can easily see their current winnings, current bet level and credits at the top of the screen. The options to change your bets or to purchase more tickets are at the bottom. There is also a "Help" button that will give you all of the information you need to enjoy this captivating Egyptian-themed instant game. Players can customize their bet size in this game; this is ideal as it caters to players of all bankrolls. Bets begin at a minimum of 50p and go all the way to £10. When a ticket is purchased, 4 rows are opened up and all players need to do is match symbols to win. You will need to scratch each square to reveal the symbols. The goal is to match identical symbols; each has its own payout amount. You may find high paying pyramids or hieroglyphs, but as long as you can match symbols you will win. The ultimate treasure in this exciting scratch card game is the huge jackpot that you can hit multiple times. This jackpot increases every second for every ticket that is purchased for the game and it will continue to grow until one lucky player takes the prize. The longer it takes to claim the jackpot, the larger the payout will be when it is hit so you should be sure to play for your chance to win this ever-increasing progressive jackpot prize. 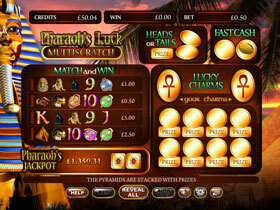 Pharaoh's Luck could be yours at any time! To win the progressive jackpot, you will need to find 2 scarabs behind their bronze covers. The Lucky Tails and Heads or Tails modes add even more excitement to the game and give you the chance to continue winning from a single game. This game certainly merits the attention of instant game aficionados; if winning big is to your liking you may wish to give Pharaoh's Luck a scratch!